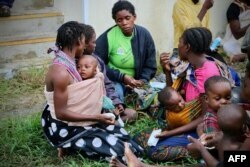 Mozambique braced itself Tuesday for a mounting death toll and a host of humanitarian needs in the wake of Cyclone Idai, which hit the coastal city of Beira on Friday, before moving through Mozambique and on to Malawi and Zimbabwe. 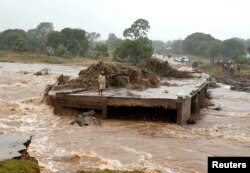 A man looks at a washed away bridge along Umvumvu river following Cyclone Idai in Chimanimani, Zimbabwe, March 18, 2019. The initial, official death toll in the country stood at 84, but Mozambican President Filipe Nyusi announced late Monday, after flying over the affected areas, that he estimated the number could be as high as 1,000. The International Federation of Red Cross and Red Crescent Societies said in a statement Monday the damage to Beira was "massive and horrifying," and estimated that 90 percent of the city, which is home to more than half a million people, was destroyed. On Tuesday, Mozambique-based UNICEF spokesman Daniel Timme said the agency is still seeking information on the impact of the storm. Speaking to VOA via Skype from Maputo, the capital, he said "we still don't have the full picture of the situation" at the moment. "But we agree with the assessment of the government that the disaster is of a dimension which is much, much bigger than we thought in the beginning," he added. "This is due to the fact that information was coming in very slowly, because the city of Beira had been been cut off of all communication lines and still is, and has also been cut off physically because the roads to Beira are destroyed." 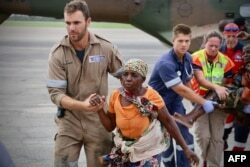 People are escorted to safety by aid workers at the airport of the coastal city of Beira in central Mozambique on March 19, 2019, after the area was hit by the Cyclone Idai. Ndivhuwo Mabaya, spokesman for the South African Department of International Relations and Cooperation, said members of the South African National Defense Force landed in Mozambique on Saturday to assist that nation's military in search and rescue efforts. South Africa will try to do more, he said. "We have also called on South African companies to donate for humanitarian assistance and following this morning's assessment, we'll make a further announcement for how we'll assist going forward," he said Tuesday. Displaced people get food and drink after arriving at the airport of the coastal city of Beira in central Mozambique on March 19, 2019, which was hit by Cyclone Idai. Timme said once the rescue operation is done, humanitarian agencies will still have serious work to do. To that end, UNICEF has appealed to donors for $20.3 million to support its response in all three affected countries. "We are at the same time actually preparing to supply people with the most urgent things," he said. "What is very important in such situations is the supply of safe drinking water, so we will be supplying water purification pills." On Tuesday, the European Union announced it would release an initial emergency aid package of nearly $4 million to assist all three countries. Mozambique will receive much of that money.